This fresh, uncured cheese is made from whole, part-skimmed or skimmed pasteurized cow's milk. 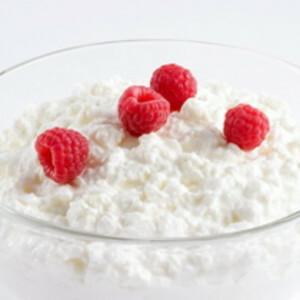 Mildly sweet in flavor and quite moist in texture, cottage cheese can be eaten plain or along with fruits or vegetables. It's also a versatile, lower-fat ingredient in recipes traditionally calling for cream or ricotta cheeses, such as lasagna or cheesecake. Richard M. Nixon was a notable cottage cheese lover, notorious for eating his cheese covered with ketchup. Cottage cheese is available is several forms and varieties. First, the curd size can be small, medium or large (sometimes called "popcorn"). Small curd cheese is made up of smaller curds that are rather firm because they have been heated for a longer period time. Larger curd cheese is made up of larger, softer curds. Most cottage cheese is "creamed," meaning a milk or cream mixture has been added to the curds. Creamed cottage cheese comes in whole-milk (4-8% milk fat) or low-fat (1-2% milk fat) varieties. Nonfat (skimmed) cottage cheese does not contain any cream, and is therefore much drier in consistency. Cottage cheese is sold plain, salted or unsalted and in a variety of flavors such as chive or pineapple. As with all dairy products, check the "sell-by" date on the container to make sure you're buying the freshest cheese available. Store in its original container in the coldest part of the refrigerator. If you turn the container upside down (make sure it's tightly sealed), it will stay fresher longer. Mind the date on the container, and use within one week after opening. If the cheese mixture separates, turns watery, sour-smelling or moldy—throw it out. • Spoon onto tomato slices and drizzle with vinaigrette. • Swirl with jelly or jam and spread on toast. • Serve over fresh greens. • Use as a simple topping for cooked pasta or baked potatoes. • Sprinkle with granola and drizzle with honey. • Bake into your favorite lasagna in place of ricotta. • Use as a filling for blintzes and crepes. • Use cottage cheese in place of ricotta cheese.